What the heck is a cordyceps supplement? Well, it's a mushroom. And the latest research is showing that cordyceps mushrooms and supplements can have noticeable benefits for your health. Below is an overview and a few good cordyceps supplement brands. Mother nature provides us with a cornucopia of incredibly beneficial fruits, vegetables, herbs and plants that possess a myriad of different health benefits. Lately, you’ve probably heard a lot about nature’s latest miracle, the cordyceps mushroom. Today, we’re going to take a closer look into what makes this mushroom such a beneficial addition to your training regimen, and take a look at five of the best cordyceps supplement brands on the market. 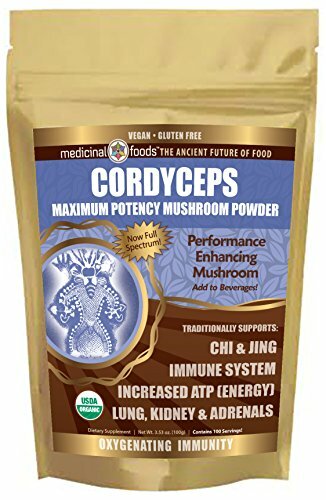 CORDYCEPS Full-Spectrum Mushroom Superfood Powder: Highest Potency Performance & Immunity Enhancer. Preworkout Oxygen Boost. Add to Smoothies & Tea. Organic, Vegan, Non-GMO, Gluten-Free! The cordyceps mushroom is indigenous to China, where it was recently referred to as ‘Tibet’s golden worm’ by National Geographic. (1) This oddly shaped mushroom looks something like a worm, and for hundreds of years, that’s exactly what it was believed to be. Only recently has it been discovered that the cordyceps is not some strange worm, but in fact, a mushroom. For thousands of years, the cordyceps mushroom was used liberally in ancient Chinese and Tibetan medical practice. The cordyceps was prized for its ability to energy, sleep habits, digestion, stamina, libido, and endurance. More recently, the western world became familiar with this mushroom, thanks in part to their use by the record-breaking Chinese women’s track team in the 1990s. Since then, scores of different cordyceps powders, extracts, and pills have hit the market, all promising incredible results. What Does Cordyceps Do For You? Incorporating cordyceps into your health, wellness and workout regimens can have some profound effects. In addition to the health and wellness benefits of cordyceps, there’s also some compelling evidence that it also makes an effective pre-workout, as well. One of the most impressive benefits of cordyceps is its ability to increase ATP production. (2) In case you’re a little rusty on biology 101, here’s a refresher: ATP or Adenosine triphosphate is the stuff that provides energy to each cell in your body. An increase in ATP means an increase in available energy. While an increase in ATP can benefit anybody, it’s particularly beneficial to athletes and people who train with weights. Cordyceps also seems to have a positive effect on cholesterol within the body. (3) As bad cholesterol increases and threatens the heart and various other organ systems, cordyceps can help increase the good cholesterol in our bodies, which can help to protect us against the effects of bad cholesterol. Perhaps most important of all, cordyceps appears to have a positive influence on cardiac health. Recent studies suggest that cordyceps powder can help prevent against heart failure. (4) While researchers don’t completely understand the mechanisms at work that make cordyceps a heart-healthy choice, they believe it has something to do with the anti-inflammatory and antispasmodic effects of cordyceps. Already, there’s a pretty strong case for incorporating cordyceps into your training routine, but the hits just keep on coming. There is scientific evidence that suggests that cordyceps can reduce the size of cancerous tumors. (5) This is good for many reasons. First, if tumors are shrinking, the cancer is unable to spread further. It’s also easier to remove smaller tumors or treat them with radiation or chemotherapy. Cordyceps also helps spur the growth of new NK cells. (6) NK or ‘natural killer’ cells are like our own personal army that lives inside our bodies. They are the first line of defense against illness and infection. We’re just beginning to understand the different benefits of cordyceps as a supplement for workouts, and more research is needed to fully substantiate some of the incredible claims people are making about cordyceps. It looks like cordyceps may make a powerful pre-workout supplement as well, in addition to all of the other benefits these magical mushrooms possess. What we do know is that cordyceps can help to provide the extra boost of energy we’re all looking for from a pre-workout, but what about other benefits? However, in human trials, it seems that cordyceps may only be able to reduce fatigue in older individuals if it provides any benefit at all. Regardless, considering all of the other benefits of cordyceps, you may want to consider using cordyceps 30-45 minutes before workouts to see if there are any additional benefits for your training routine. Before we dive into some of the best cordyceps supplements available on the market today, it’s important to understand how this mushroom is cultivated for medicinal use. There are two different ways that cordyceps are cultivated for commercial consumption. By the 1980’s, it became clear to the Chinese that there was no way that mother nature could keep up with the demand for these wild mushrooms. Prices of wild cordyceps skyrocketed, with a pound of this magical mushroom often costing upwards of $,9000! In an attempt to protect the cordyceps mushroom from overharvesting, the Chinese government drafted legislation designed to protect this national treasure. As you’d imagine, you won’t find the extremely expensive wild variety of this mushroom at your local supplement shop. As a result, an alternative was developed. This alternative could be cultivated in large liquid fermentation tanks. Once the growth process is complete, the cordyceps, and sometimes the sterile liquid which was used in the fermentation process is removed, dried and sold. This is believed to be the superior cultivation process for the cordyceps that are used in today’s supplements. Cordyceps grown in America use sterile grains, such as oats as the growing medium for the mushrooms. Once the cordyceps are ready for harvest, they are dried and ground into a powder. Many companies include the grain in their final product, which leads to cordyceps with a high level of starch. In fact, up to 65% of the final product of grain cultivated cordyceps is starch. This can present a problem for people who are sensitive to grains or starches. More research is required to substantiate whether or not cordyceps cultivated on grain is any less therapeutic than cordyceps cultivated through liquid fermentation, but early indications suggest that the liquid fermented product is of higher quality. Sacred 7 from Naturealm gets its name from the fact that it employs seven different species of mushrooms. Inside each bag, there’s a blend of reishi, maitake, cordyceps, shiitake, lion’s mane, turkey tail, and chaga mushrooms. While we’ve focused entirely on cordyceps so far, there are medicinal benefits to other mushroom species, and Sacred 7 seeks to harness those benefits. While many of these mushrooms have similar properties to cordyceps, they aren’t necessarily as effective as cordyceps. 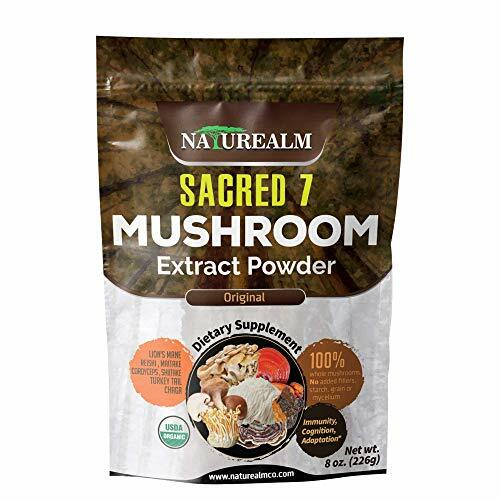 Sacred 7 is the most well-rounded mushroom supplement on this list, thanks to the inclusion of several species of mushrooms. But, if you’re looking for a strictly cordyceps supplement, you may want to read on. 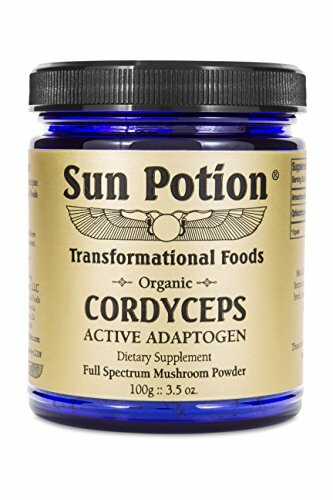 CORDYCEPS MUSHROOM POWDER Sun Potion offers an organically cultivated cordyceps blend grown in the USA. Our Cordyceps provide an excellent level of active components. A GREAT ADDITION to soups, raw chocolate, shakes, smoothies, coffee, warm water and tea and anytime you're looking to activate fortitude, sensuality, and endurance. Unlike Sacred 7 which features a blend of mushrooms, this organic cordyceps powder from Sun Potion contains only cordyceps powder. This is a high quality powder that’s ground very finely, so you’ll have no problem mixing this into anything you can think of. Most people prefer to mix the powder into their morning coffee or tea. However, it can be added to practically anything. Grown in simulated conditions of 18,000 ft Tibetan Mountains - Low temp and low O2 Grown! This organic, gluten-free, non-GMO and vegan offering from the Medicinal Foods company provides you with all the cordyceps goodness you’ll need. Medicinal Foods goes to great lengths to simulate the growing conditions that cordyceps mushrooms thrive under in their native habitat of the Tibetan mountains. They’re grown in a low temperature, low oxygen environment at a simulated elevation of 18,000 feet above sea level. At 98% pure, only 2% of the growing substrate makes it into the final product. While Sun Potion goes to great lengths to grow their cordyceps power under conditions that simulate the landscape that the cordyceps mushroom grows best in, BioFinest takes it a step further. Their cordyceps power is harvested directly from the Tibetan mountains. As you’d expect, it’s organic, non-GMO, vegan and gluten-free. 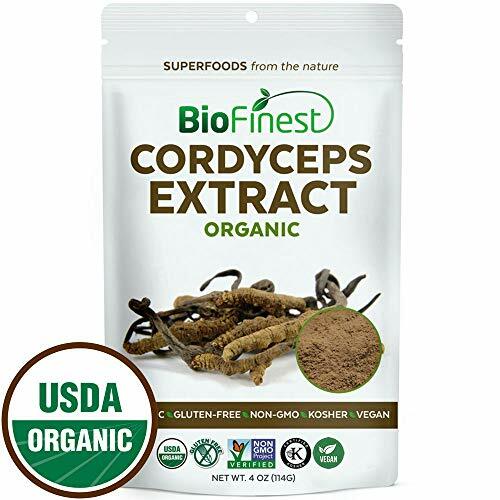 BioFinest cordyceps mushrooms are harvested by hand and grown sustainably, so you can feel good about this brand and the practices they engage in. Since these cordyceps are harvested in Tibet, they use the liquid fermentation process which is revered as the best way to cultivate cordyceps. 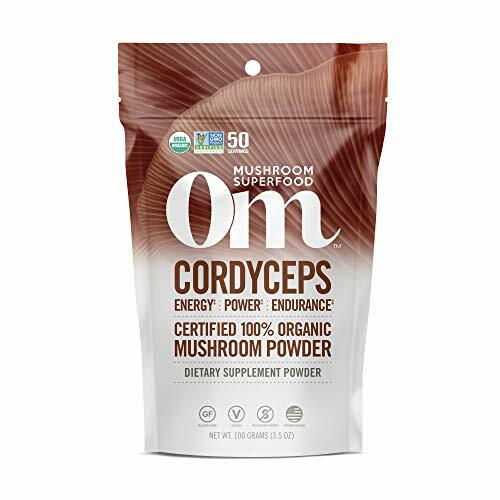 This cordyceps powder from Om (formerly Mushroom Matrix) is cultivated and manufactured in San Marcos, California. This is one of the most affordable cordyceps powders available on the market. However, it’s worth noting that Om cultivates their cordyceps on grains, which is regarded as being a less effective method of cultivation than liquid fermentation, and as a result of the growth process, this product is not gluten-free. While each supplement we’ve reviewed is a fine option, we believe there is one that stands out as a bit better than the rest. BioFinest cordyceps powder is the only one of the five we’ve covered that’s harvested in Tibet, where the mushroom grows natively. It’s also produced through liquid fermentation so it contains no starch, and it’s gluten-free. Whether you choose one of the supplements above, a different powdered cordyceps supplement, or even pills or liquid varieties of cordyceps, the fact remains that taking a cordyceps supplement is a great way to realize the benefits this powerful mushroom is capable of. Whether you’re looking for an energy boost, a potential new pre-workout, or you’re just seeking to generally improve your health and wellness, you may want to look to add cordyceps to your daily routine. Filtered Water Bottles: Should I Get One?